DESCRIPTION -- Great souvenir item commemorating the famous Lord Nelson ship HMS Victory which is a miniature bed pan which is in a very good condition. The item shows on it an embossed picture of the ship and the name and is an early souvenir item which celebrates this fantastic old vessel (click on the picture for a close up of one of the item). HISTORY -- HMS Victory is a 104-gun first-rate ship of the line of the Royal Navy, ordered in 1758, laid down in 1759 and launched in 1765. She is best known as Lord Nelson's flagship at the Battle of Trafalgar in 1805. She was also Keppel's flagship at Ushant, Howe's flagship at Cape Spartel and Jervis's flagship at Cape St Vincent. After 1824, she served as a harbour ship. In 1922, she was moved to a dry dock at Portsmouth, England, and preserved as a museum ship. She has been the flagship of the First Sea Lord since October 2012 and is the world's oldest naval ship still in commission. DESCRIPTION -- Great souvenir item commemorating the famous Battle of Trafalgar which is a boxed set of 7 superb medallions which are all in a fantastic condition (click on the picture for a close up of one of the medallions). HISTORY -- The Battle of Trafalgar (21 October 1805) was a naval engagement fought by the Royal Navy against the combined fleets of the French and Spanish Navies, during the War of the Third Coalition (August'December 1805) of the Napoleonic Wars (1803'1815). The 200th anniversary of 'The Battle of Trafalgar' was celebrated in 2005 and this item is one of many pieces celebrating that Napoleonic period and landmark anniversary. DESCRIPTION -- A plaster cast cut souvenir figure of Lord Horatio Nelson and the size is 2" (6cm). 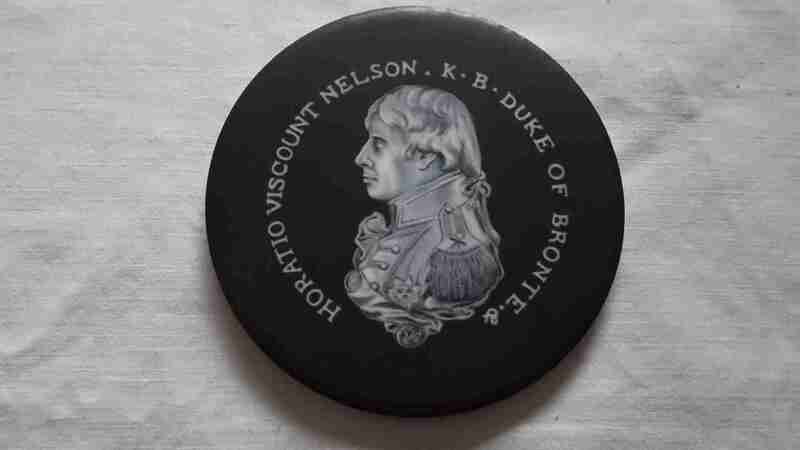 HISTORY -- Horatio Nelson, 1st Viscount Nelson, 1st Duke of Bronté KB (29 September 1758 ' 21 October 1805) was a British flag officer in the Royal Navy. He was noted for his inspirational leadership, superb grasp of strategy, and unconventional tactics, all of which resulted in a number of decisive naval victories, particularly during the Napoleonic Wars, (1797-1815). 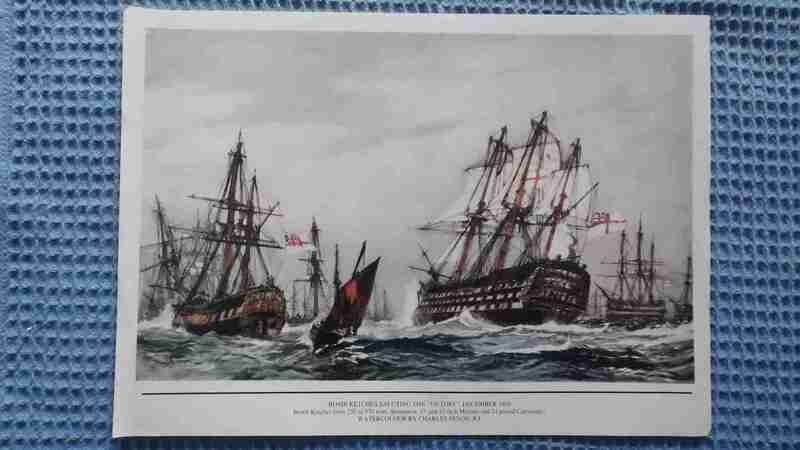 DESCRIPTION -- Copy of a water colour by Charles Dixon showing the Battle of Trafalgar which is in a great condition. DESCRIPTION -- Souvenir coaster mat showing on it Lord Horatio Nelson which is in an excellent condition (click on the picture for a closer view). HISTORY -- Lord Nelson was one of Britain's greatest naval commanders. He had a long and distinguished career, in which he gained a reputation as a master tactician and great personal bravery. His crowning moment came at the Battle of Trafalgar, where Britain's decisive victory over Napoleon's fleet ended the threat of a French invasion. DESCRIPTION -- Souvenir plate from the famous Lord Nelson Flagship HMS Victory which is in a fantastic condition and is 8" (21.5cm) wide and shows in the centre a picture of the vessel and the ships name. HISTORY -- HMS Victory is a 104-gun first-rate ship of the line of the Royal Navy, laid down in 1759 and launched in 1765. She is most famous as Lord Nelson's flagship at the Battle of Trafalgar in 1805. She was also Keppel's flagship at Ushant, Howe's flagship at Cape Spartel and Jervis's flagship at Cape St Vincent. After 1824 she served as a harbour ship. In 1922 she was moved to a dry dock at Portsmouth, England, and preserved as a museum ship. She is the flagship of the First Sea Lord and is the oldest naval ship still in commission. DESCRIPTION -- Souvenir brown mug from the most famous of all vessels moored at Portsmouth The HMS Victory which is in an excellent as new condition. DESCRIPTION -- Unmade and brand new kit model of a Nelson period 24lb brass canon which is made up of wood and metal parts and is excellent value, and will look great when built. This model is now no longer available to buy in the shops. DESCRIPTION -- Fantastic book entitled 'Trafalgar:The Nelson Touch' which contains over 250 pages and gives an account of the life of Nelson and the great Battle of Trafalgar, and was produced in the 1960's (click on the picture for a view of the inside pages). HISTORY -- The Battle of Trafalgar (21 October 1805) was a sea battle fought between the British Royal Navy and the combined fleets of the French Navy and Spanish Navy, during the War of the Third Coalition (August'December 1805) of the Napoleonic Wars (1803'1815). The battle was the most decisive British naval victory of the war. Twenty-seven British ships of the line led by Admiral Lord Nelson aboard HMS Victory defeated thirty-three French and Spanish ships of the line under French Admiral Pierre-Charles Villeneuve off the south-west coast of Spain, just west of Cape Trafalgar. The Franco-Spanish fleet lost twenty-two ships, without a single British vessel being lost. DESCRIPTION -- Unmade and brand new kit model of a Nelson period 18lb brass canon which is made up of wood and metal parts and is excellent value, and will look great when built. This model is now no longer available to buy in the shops.